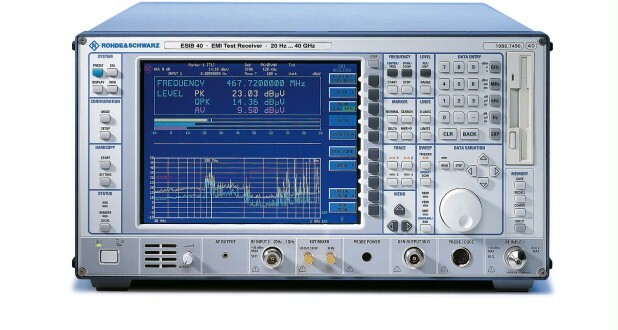 Each R&S®ESIB combines the high sensitivity, large dynamic range and selectivity of a high-end EMI test receiver with the flexibility and speed of a top-class spectrum analyzer. Excellent technical specifications have been a distinguishing mark of Rohde & Schwarz EMI test receivers right from the beginning. The R&S®ESIB EMI test receivers fully comply with the basic standard CISPR 16-1-1 and carry out measurements in conformance with all civil and military EMI standards such as CISPR, EN, VDE, ANSI, FCC, BS, ETS, VCCI, MIL-STD, VG, DEF-STAN, etc. The upper frequency limit of the R&S®ESIB26 and R&S®ESIB40 can be extended up to 110 GHz by means of external mixers (options R&S®FSE-B21 and mixers R&S®FS-Zxx required). Each R&S®ESIB offers features and test routines for the various stages of product development as well as for the final EMC certification tests.